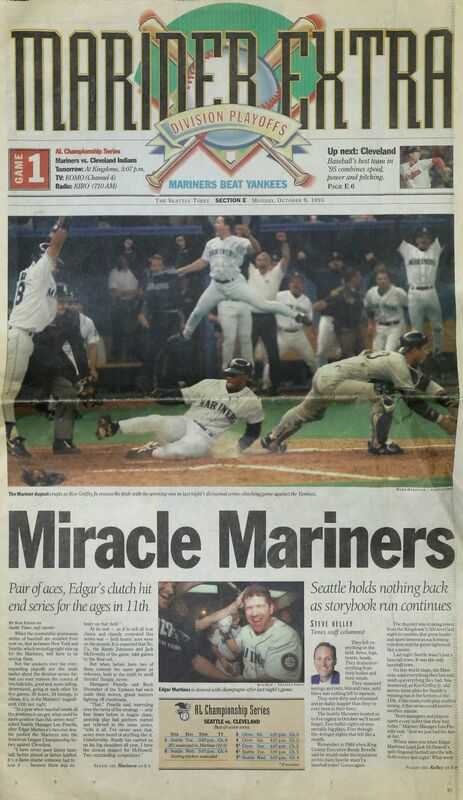 From the Big Unit to The Kid, The Catch to The Double, and the calls of "My Oh My" and "Everybody Scores" that still echo in our ears 20 years later, these are the most memorable moments of an unforgettable 1995 Mariners season. 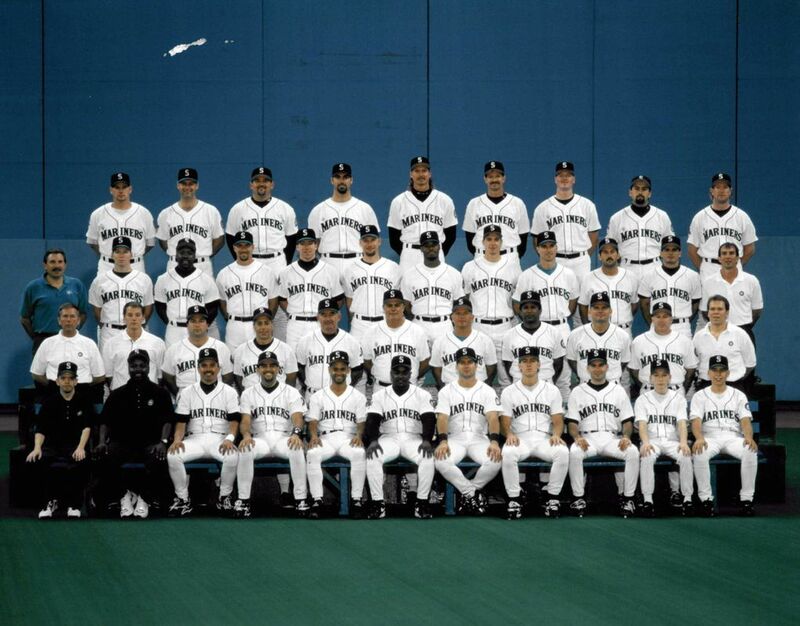 1995 Seattle Mariners Back Row L-R: Bill Risley, Tim Belcher, Chris Bosio, Andy Benes, Randy Johnson, Lee Guetterman, Jeff Nelson, Bobby Ayala, Norm Charlton. 3rd Row L-R: Clubhouse manager Henry Genzale, Bob Wolcott, Vince Coleman, Mike Blowers, Chris Widger, Jay Buhner, Ken Griffey Jr., Dan Wilson, Tine Martinez, Bob Wells, Rich Amaral, head trainer Rick Griffin. 0 2nd Row L-R: Video coordinator Carl Hamilton, strength and conditioning coordinator Allen Wirtala, bullpen coach Matt 1 Sinatro, third base coach Sam Perlozzo, bench coach Lee Elia, manager Lou Piniella, pitching coach Bobby Cuellar, first base coach Sam Mejias, dugout coach John McLaren, administrative coach John Moses, assistant trainer Tom Newberg. Front Row L-R: Clubhouse assistants Pete Fortune and Michael Spears, Felix Fermin, Luis Sojo, Joey Cora, Warren Newson, Edgar Martinez, Doug Strange, bullpen catcher J.D. Klein, bat boys Brett Genzale and Joe Diaz. 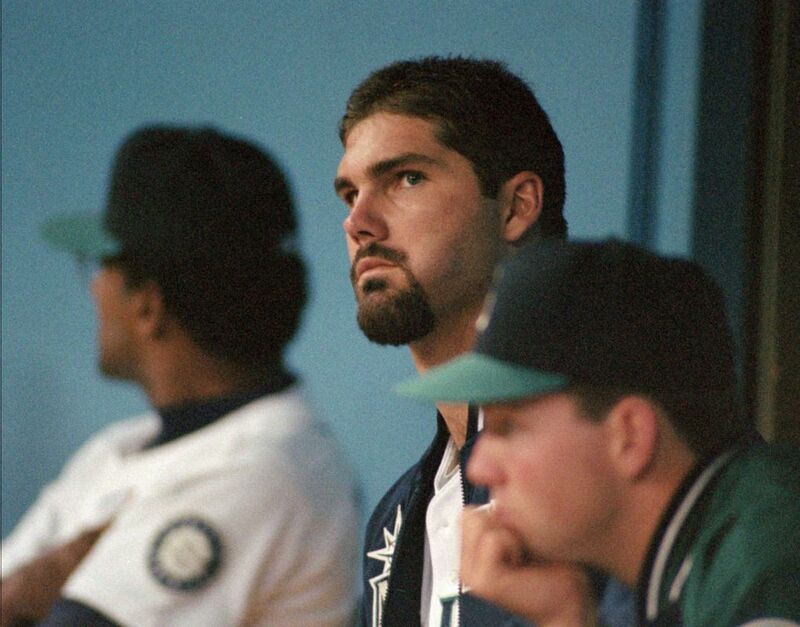 Amid swirling rumors that ace Randy Johnson, DH Edgar Martinez and pitcher Chris Bosio might be traded to trim payroll, the team declares that Johnson is off the table, and they will leave the team intact despite losses of $40 million over the previous 2 ½ years. 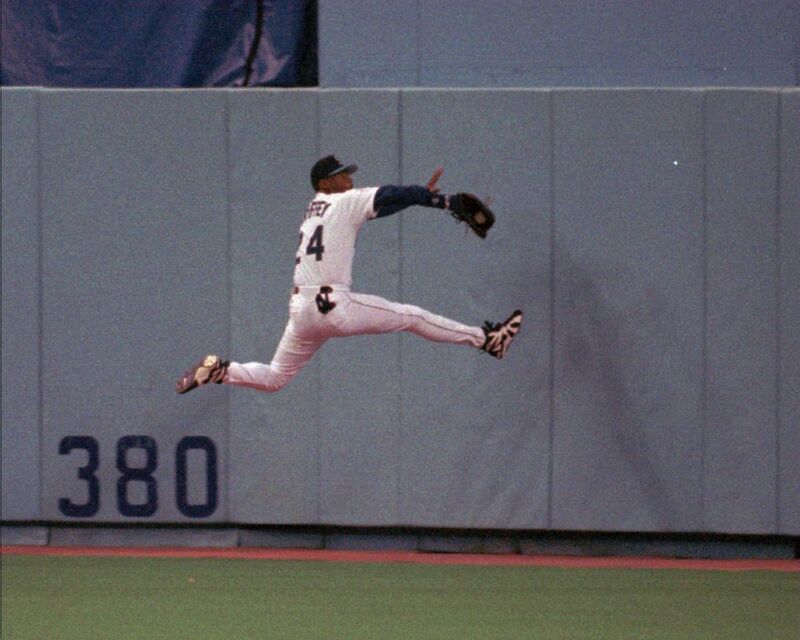 Mariners suffer a devastating blow when Ken Griffey Jr., while making another in a long line of brilliant catches, breaks his left wrist. Crashing into the Kingdome wall in right-center to snare a drive by Baltimore’s Kevin Bass, Griffey fractures his distal radius bone, requiring surgery in which a steel plate and seven screws are put in his wrist. “We’ve got to show our character now,” manager Lou Piniella says. “That’s why they call it a team.” Griffey misses nearly three months, returning to action Aug. 15. With Alex Diaz and Rich Amaral platooning in center, the M’s go 36-37 in his absence, and drop 10 games to the Angels in the standings, from 2 ½ back to 12 ½. In the most significant stretch-drive acquisition in team history, the Mariners trade two of their top prospects, outfielder Marc Newfield and pitcher Ron Villone, to the Padres for veteran pitcher Andy Benes. It’s a classic rent-a-player move, because Benes was to be a free agent after the season. 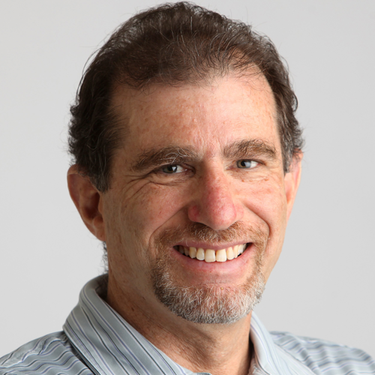 “We really wanted Andy Benes,” Mariners executive Roger Jongewaard tells The Seattle Times. “We feel this year is a big year for us, with the pennant race, the wild-card race and the stadium vote.” Other key midseason acquisitions for the Mariners included Salomon Torres (May 21), Norm Charlton (July 14) and Vince Coleman (Aug. 15). The Angels edge the Mariners, 5-4, in Anaheim to increase their winning streak to eight games and pull to 13 games ahead of Seattle in the AL West standings, the M’s largest deficit of the season. Only two teams in history, the 1914 Boston Braves (15 games) and 1978 Yankees (14 games) have ever come back from farther behind. Angels shortstop Gary DiSarcina, a team leader, goes down with a thumb injury, a loss that would prove critical. DiSarcina tears ligaments sliding into second base in a 10-7 victory by the Mariners. The Angels would go through two nine-game losing streaks as Seattle needed just 28 days to erase California’s double-digit lead. When DiSarcina returns on Sept. 22, the M’s have a one-game lead. Ken Griffey Jr. starts the Mariner Miracal finish with his game winning homer against the Yankees in late August. 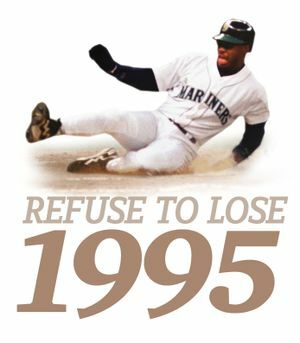 In a game the team would label as the catalyst for its furious title run, Ken Griffey Jr. — nine days after returning from his wrist injury — launches a two-run homer off Yankees closer John Wetteland with two outs in the bottom of the ninth to lift the Mariners to a 9-7 win. 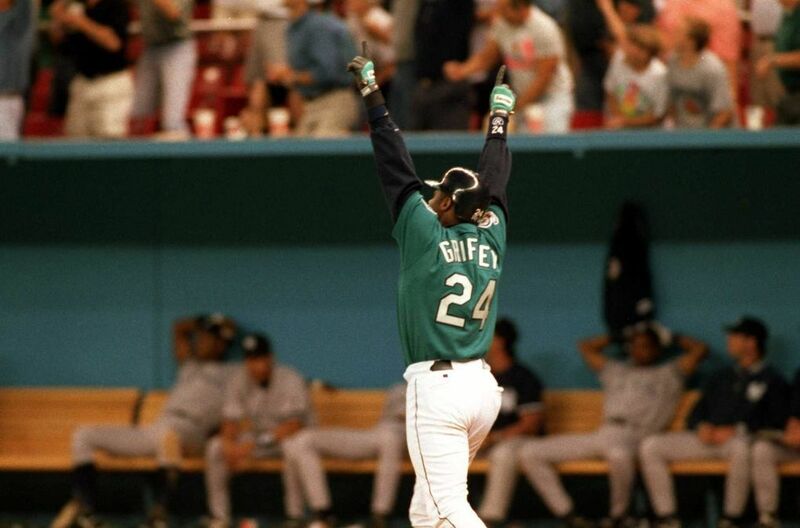 The term hasn’t been invented yet, but it is the first “walk-off” homer of Griffey’s seven-year career. The Mariners go 25-11 the rest of the season, while the Angels, who were once 64-38, go 14-28. The Angels could have won the division merely by playing .357 ball. Maybe the greatest in a long line of exhilarating victories, the Mariners thrill a Kingdome crowd of 46,714 with a wild 9-8 win over Oakland on Tino Martinez’s two-run homer in the ninth off A’s relief ace Dennis Eckersley. On his broadcast, Dave Niehaus calls it “perhaps the most incredible game in their history! And 46,000 fans are losing their minds in Seattle! Tonight, I guarantee you, it will be sleepless in Seattle for everybody who was here today, including me!” The Mariners now lead the AL West by two games with six to play. Opening Day. John Ellis and Chuck Armstrong watch a video from last seasons highlights on the scoreboard screen before the game. 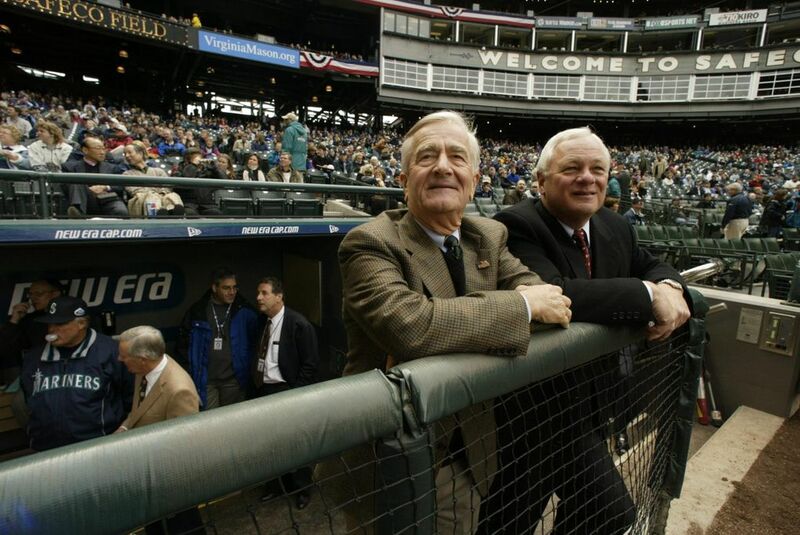 On the day after the stadium referendum is officially defeated by a mere 1,082 votes — the outcome had been in doubt until the absentee ballots were counted — Mariners chief executive John Ellis tells King County Executive Gary Locke that if the county doesn’t come up with a plan for a new stadium within 30 days, the ballclub will go up for sale. His original intent had been to put the team up for sale immediately, but Gov. Mike Lowry and Locke convince him to wait a month. The M’s, meanwhile, beat Texas to maintain their two-game lead with three to play. After the Angels sweep a four-game series from Oakland and the Mariners drop three of their last five to blow a three-game lead, the M’s and Angels, tied at 78-66, meet in a one-game playoff at the Kingdome. Fans had waited out the end of a Seahawks game and scooped up all 52,236 tickets in a matter of hours. Dueling the man he was traded for, Mark Langston, Randy Johnson retires the first 17 batters he faces, strikes out 12, and goes the distance in a 9-1 victory that puts Seattle into the postseason for the first time in club history. 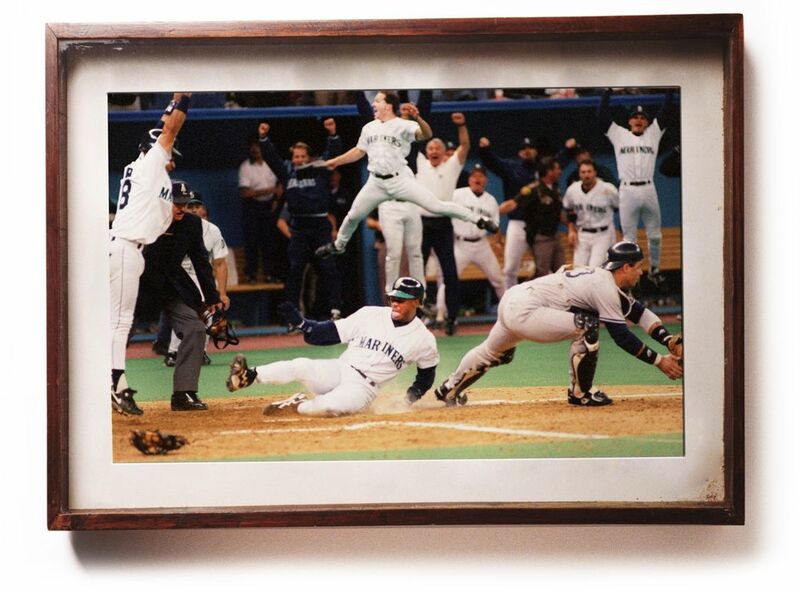 The game’s signature moment occurs with two outs in the bottom of the seventh, with Seattle clinging to a 1-0 lead, when Luis Sojo clears the bases on a broken-bat cue shot down the right-field line. Sojo secures his own legend status by coming all the way around to score on Langston’s wild relay to the plate. “Everybody scores!” was Rick Rizzs’ classic call. The Mariners, after losing the first two games of the Division Series at Yankee Stadium, complete a stunning turnaround by edging the Yankees, 6-5, in 11 epic innings, to advance to the American League Championship Series against Cleveland. Johnson comes out of the bullpen in the 9th, Edgar hits a double in the 11th, Junior runs very fast around the bases, and chaos reigns at the Kingdome. 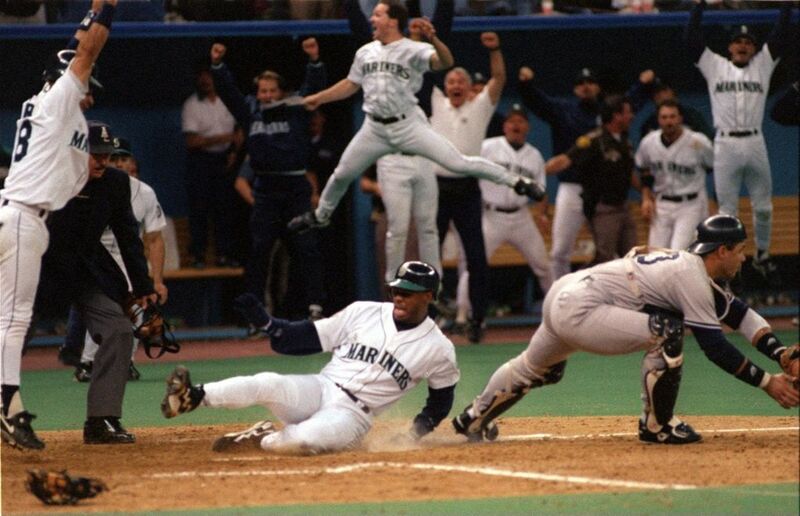 The sports moment of the ages in Seattle. 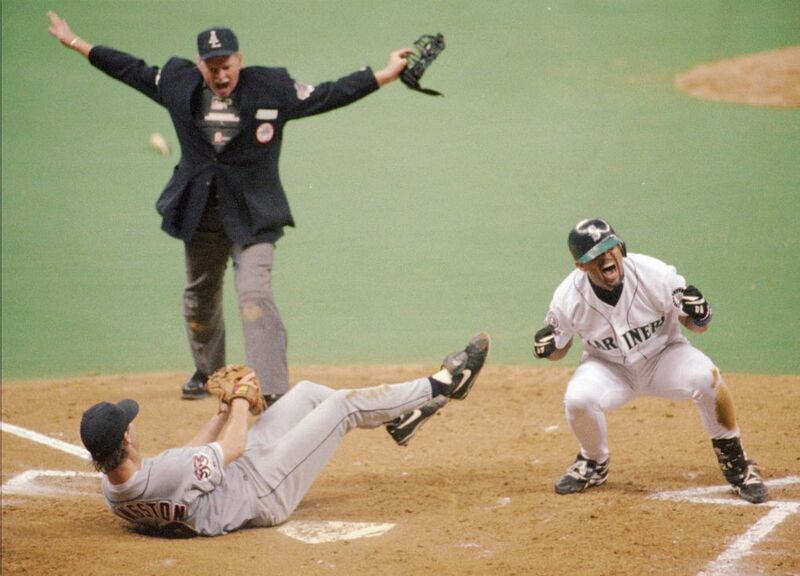 The dream ride ends short of the World Series, when Cleveland wins the ALCS in six games with a 4-0 victory at the Kingdome. Seattle had won two of the first three, but dropped the next three, two of them by shutout after being shut out just twice previously all season. 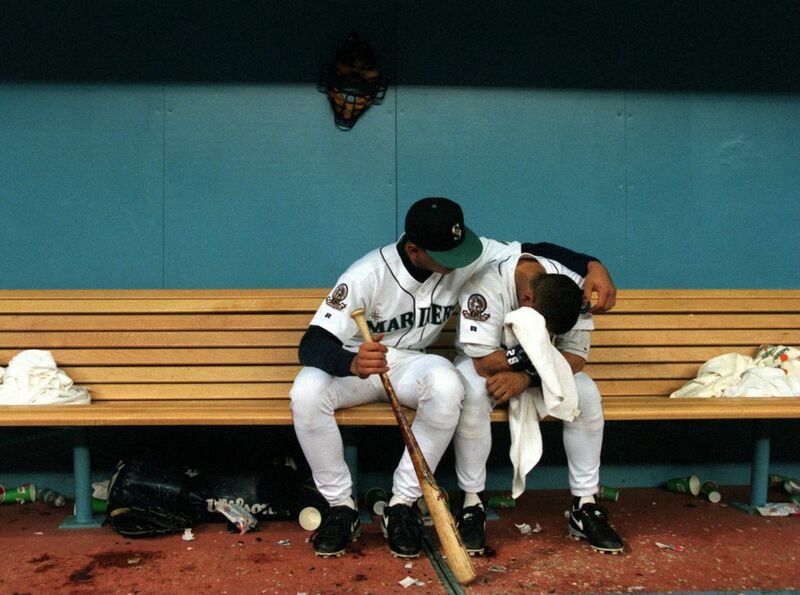 After the game, Joey Cora sits on the dugout bench and cries, consoled by 20-year-old rookie Alex Rodriguez. The sellout crowd refuses to leave, and the Mariners return to the field, en masse, for an emotional encore. The Mariners finally get a stadium when the Metropolitan King County Council votes 10-3 to implement the financing package that had been approved by the state legislature in special session Oct. 14. The plan calls for the Mariners to kick in $45 million, with $59 million coming from a state sales-tax credit, $48 million from a scratch-off state-lottery game and the rest from county-wide taxes on restaurant and bar tabs, car rentals and ballpark admission. 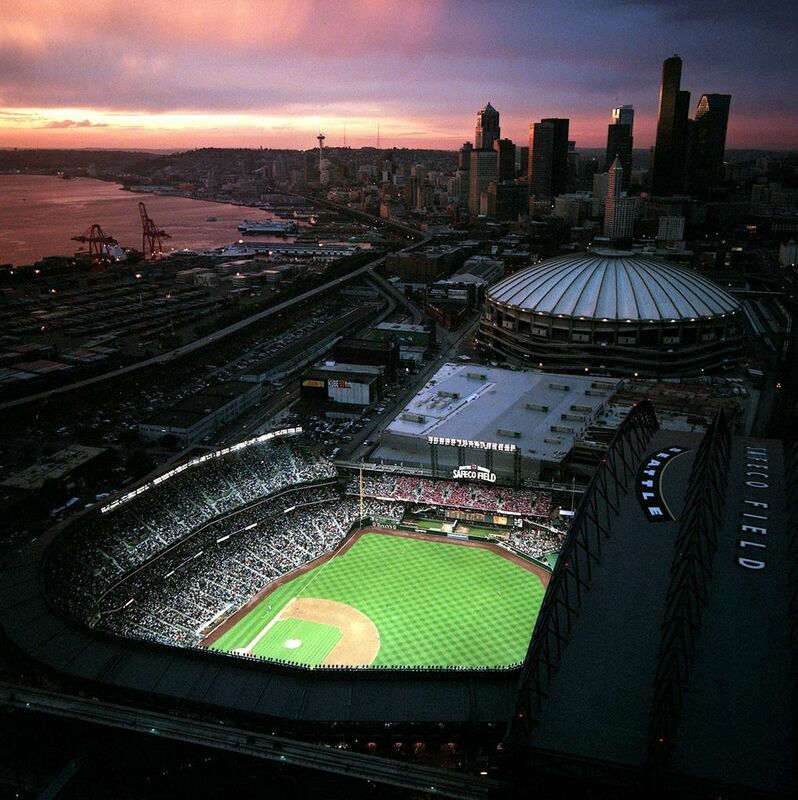 Several twists and turns were ahead, but Safeco Field opened on July 15, 1999.